I prepare the old systems before I give them away. This involves deleting all files and the operating system, and installing a new operating system once the hard drives have been formatted and I have made sure that the data on the drives is no longer recoverable. Software like Hardwipe can be used to erase hard drives securely. Securely in this regard means that the data on the drive will be wiped so that it cannot be recovered anymore. 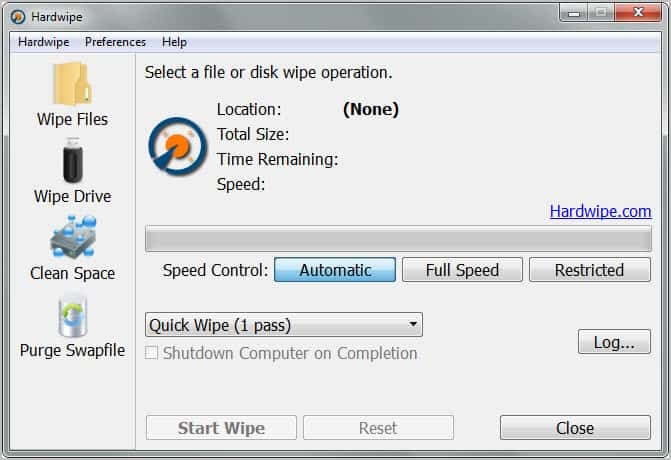 Hardwipe is only one of the programs for that specific task. Other suitable applications include Prevent Restore, Eraser or Blank and Secure to name a few. All have in common that they overwrite files, hard drives or unused disk space to render file recovery software useless. When you first start Hardwipe, you are presented with the following interface. Here you can select to wipe files or drives, clean free space or purge the Windows swapfile. The configuration options on the right side of the interface remain the same regardless of selection. You can change the method that is used to overwrite data. Available are quick wipes which overwrite the selected data once to the Gutmann algorithm which overwrites data 35 times. It is furthermore possible to change the speed control setting from automated to full speed or restricted. A click on Wipe Files opens a file browser which can be used to select individual files or folders for secure deletion. It is possible to select multiple files or folders by holding down the Ctrl key during selection. Wipe Drive on the other hand asks the user to select a drive or partition to erase all data on that hard drive permanently. Clean Space finally is used to delete all traces of previous files on a partition’s or hard drive’s free space. The Purge Swapfile option, even though listed, is not functional yet. Hardwipe is a solid alternative for other tools that wipe hard disks and delete files securely under Windows. Tooltips would be handy to explain some options in the program interface that may not be clear immediately. The software integrates into the Windows Explorer context menu to securely delete files and folders directly from the default file manager. Windows users can download the latest version of Hardwipe from the developer website. The program is compatible with 32-bit and 64-bit editions of the Microsoft Windows operating system. This entry was posted on Tuesday, November 29th, 2011 at 10:40 am	and is filed under software evaluation, tech tips. You can follow any responses to this entry through the RSS 2.0 feed. Both comments and pings are currently closed.